A rustic home can be very beautiful. Many people who desire log homes love the warmth and rustic charm of a traditional log cabin, the idea of living out in the woods, connecting with nature, getting off the grid. But there is another trend in log homes, one that combines ultra-modern design with the natural beauty of logs. A kitchen can be the perfect area to start combining rustic and modern elements. Start with some traditional elements, slate floors, exposed ceiling beams, live edge countertops. Add in modern stainless appliances, glass shelving, and plastic laminate cabinets. The combination of the natural and the modern can make a very attractive look. Follow an 80/20 rule for decorating when mixing styles like rustic and modern. 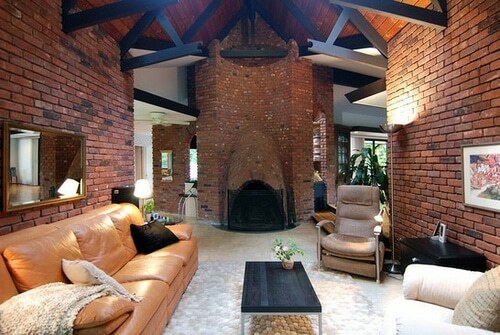 Try to keep the major elements one style, rustic for the purpose of our discussion and add in 20% as modern. This might be things like light fixtures, or a piece of modern furniture. Maybe picture frames or some modern counter stools. In the bedroom, maybe a modern bed frame and a barnwood wall. If you have a reading nook, find a big comfortable log hewn chair and combine it with a mid-century modern side table and lamp. Whatever you do, don’t clutter the space with too many items. Keep things a little minimalist, slick and clean. Not everything has to match – different but the same is key. Find items that have one thing in common and group them together. This can be color, size, texture, but putting different types of items together can be very interesting. Maybe your dresser has a number of different items, but they are all the same color. Or maybe you have a shelf in the kitchen that is all clear glass storage. If there is something you collect, group them all together and display them. Maybe you have a giant pair of antlers or an ornate vintage picture frame (yes, people like to hang just empty frames these days, I think it’s kinda weird too, but hey, you will be in style). Find something amazing and unique and make it a focal point in your room. This can be rustic or modern, but just having an unusual item will make the room much more fun. Rustic and Modern are a great pairing and TruLog Steel Log Siding can be a great addition to that modern aesthetic. Don’t just think of log siding as something traditional, but it can also be a fun pairing with modern design.